Dr. Jason Garwood is the teaching pastor and church planter here at Cross & Crown. He brings 15 years of various ministry experience, including serving in Michigan as a lead pastor for 6 1/2 years before being sent to Northern Virgina to plant Cross & Crown. 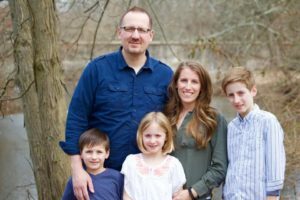 Jason holds a Bachelor of Science in Bible from Cairn University, a Master of Divinity from Biblical Theological Seminary, and a Doctor of Theology (ThD) from Hope Seminary. He released his first book, “The Fight for Joy,” in 2013, and his second book “Be Holy: Learning the Path of Sanctification” in 2014. He blogs infrequently at his website, jasongarwood.com. Jason is one of the hosts of Cross & Crown Radio, a professor with Cross & Crown Seminary, and also serves as a board member of Reconstructionist Radio. The most exciting thing for Jason, however, is that he is husband to Mary, and father to Elijah, Avery and Nathan. Words that get Jason excited? Gospel, Kingdom, mission, Mary, Law of God, Mary made homemade Chinese food, Greg Bahnsen, iPad, theology, Van Til, books, Rushdoony, justification by faith, Logos Bible Software, Dominion, and Christian Reconstruction.